Where to Go for Dark Skies? No matter where you live on earth you have a chance to witness the incredible experience of watching bits of space debris streak through our atmosphere and create cosmic fireworks. In an older column I described How to Photograph Meteors – it is a daunting and luck laden process. Here I want to give some useful hints about WHERE to go to get the best view. These same hints may also help you find a location to view the Milky Way. It might seem strange, but I pick different locations depending on what it is I want. If I just want to watch meteors then I will pick a place that may compromise the other factors. Assuming my goal is to photograph meteors, I have a second important decision: Do I want meteors, or do I want meteors in the context of a landscape? For me the answer is almost always in the context of a landscape for the reasons I illuminated in this article. In my opinion a shot of a meteor might be interesting, but a shot of a meteor over a lovely mountain, lake or landmark is WAY more interesting. For example compare the two photos below. 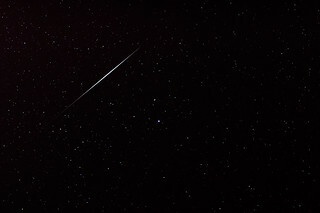 The first shot is an Iridium flare (not a meteor, though it looks like one). The second is definitely a meteor. Which one is the most interesting? Yeah, the second one! The next part of the goal is to figure out WHICH direction the landmark needs to be. For example the Geminid Meteor shower is one of the few showers where the “radiant point” is visible all night long. But that also means that it may be best to shoot East after sunset, or West before sunrise and around midnight you’ll want to point south when the constellation will be high in the sky. Of course meteors appear anywhere in the sky, but I like to keep a part of the radiant in my shots. Once I’ve figured out which direction I’d like to face, only then can I start including and excluding locations. Of course an ideal place would allow me to face ANY direction, but the truth is not many ideal places are left in the world. Now that I know which direction I’d like to face, I have to decide how much I am worried about bad weather. Out here on the US West Coast a drive of 4 hours will get me to a mountain – the Sierras, 5 to 7 hours can take me to a desert area where it will generally be clear – but often windy, and a shorter drive will get me to a coastal area that may be fog plagued in some seasons. In short, I would like to be as certain as I can about the weather conditions and thus will always have a plan B. I have previously discussed the tools I use to track and plan for the weather. 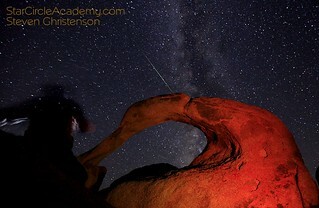 While I would love to pass the time at a High Sierra location watching a meteor shower (awesome! ), it might be really impractical or impossible for me to get there with my equipment in the dead of winter – even if the weather itself is not the problem. Road closures, park closures, etc. may interfere. If I want to take friends or clients I need to restrict the amount of schlepping and walking required. Some areas, like state, county and local parks which might be ideal are usually CLOSED, locked and gated at night. National Parks and BLM designated land are generally open at night so rank high on my favorite places list. Not only should my desired location be easy to get to by car but I would prefer a short walk to a safe location, and preferably in an area that has little or no car travel at night to ruin my night vision or my night shots. Sometimes little intangibles like the direction and slope of any nearby roads makes a big difference. If a location is the top of the hill but a road points directly at it means I probably want to be on the other side of that hill to prevent the intrusion of headlights. The arch shot above is an example of that hazard – a bend in the road causes cars to sweep their headlights across the landscape at that location. It’s also unwise to attempt to use private land without permission. Being an unwelcome guest could result in embarrassment, hassle or hazard! I have already touched upon this, but by distance I really mean time, effort and cost to reach the location. Since meteor showers occur annually, I am less inclined to make a huge effort if the circumstances do not look like they will be ideal. On the other hand, I had no problem driving 1,000 miles roundtrip to put myself in the path of the Transit of Venus – an event that will not happen again in my lifetime (or yours). The one commodity that we are perhaps in the least supply of is darkness. So many cities, so much light pollution. But I do not need TOTAL darkness. If I have decided the best view is to the south, I just need to make sure no major cities lie south of my location. If my intended view is east, then I want mountains or distance to insulate me from the glow of light pollution to my east. Unfortunately darkness is also a function of weather. Humidity, clouds, water vapor and air particulates can turn a generally dark location into an awful mess through the effect of human-made light sources. A place that is clear and dark during most of the winter might be horrible in the balmy summer. Prior experience is often the best indicator of where deepest darkness is found. Sometimes the easiest way to find a dark place is to simply look at a map – making note of the terrain and where the cities are in relation to your desired direction of view. There is a dark sky locator that may help as well. And you can do your part by joining the International Dark Sky Association and being an advocate for responsible lighting ordinances. I am a member. You’ve probably already figured out that finding a combination of an interesting foreground that is easily accessible but a not too distant place with reliable weather is no small feat. Some people think that if you go where astronomers like to go you’ll get all the right stuff. But that’s not true. Astronomers do care about almost all of these things, but the one thing that matters little to an astronomer is the landscape. Astronomers are looking at the sky so a featureless high plateau is just fine. Oh, and if you want to light paint your foreground, you will really tick off astronomers! So now you may have also surmised why I do not freely share my hard found locations. BUT if you join me on a workshop or webinar you will find out! This entry was posted in Creativity, Maps, Photo Tip, Ravings, Travel, Weather and tagged accessibility, choosing, dark sky, darkness, features, foreground, light pollution, locations, meteors, milky way, night sky, travel, viewing on December 7, 2012 by Steven Christenson. Another variable is the seasonal presence/absence of forest fires. I learned long ago that visiting Yellowstone, Grand Teton and Glacier National Parks you usually get clearer skies in the winter, spring and early summer when things are wetter than in the late summer and fall. The smoke can make for nice reddish sunsets but you definitely see more of the dirty brown in the night sky photographs. On our one trip to Denali the skies were affected by large fires in Siberia. The smaller fires may require a web search by Ranger District of BLM District.